A top class carrom player I. Navin Kalansuriya, the 2016 national schools best carrom player is no more. He died on Saturday under tragic circumstances. While travelling after a open carrom tournament held at the carrom headquarters at Kohuwella he took the Colombo-Kandy bound train. 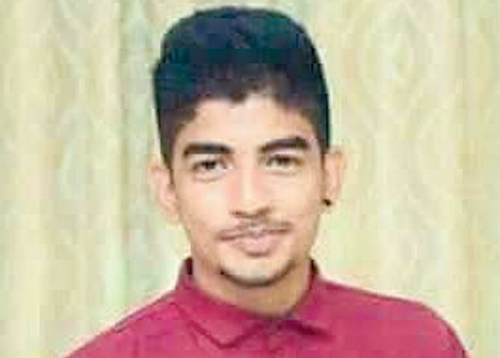 He was seated on the steps of the train compartment and stuck his head on the railway bridge wall and fell into the river, just a few kilometers from Kandy. His body was discovered a few kilometers away 15 hours later and he was pronounced dead. According to Navin’s father Nandai Kalansuriya his son’s funeral will take place on Wednesday at the Mahiyawa General cemetery. Navin was a product of St. Sylvester’s College and excelled in carrom at school and later took part as an individual player in tournaments conducted by the Sri Lanka Carrom Association. He has won many tournaments, and had been awarded the best schoolboy carrom player’s award in 2016 the year St. Sylvester’s College, under 19 team emerged as the schools all island champions.